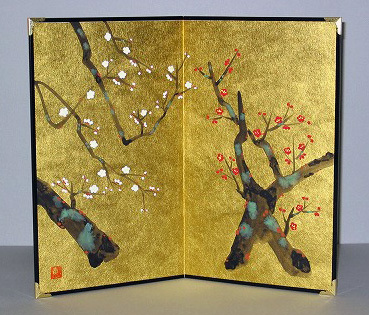 Design: Set on a traditional background of gold leaf, the main theme in this screen is ume, or plum blossom, whose delicate pink and white blossoms are a harbinger of spring. Size: 25x15cm (9.8x6 inches) per panel. Material: Washi paper, gold leaf.